In the first quarter of 2018, England’s wind industry produced a record 15,560 gigawatt-hours (GWh) of electricity, surpassing nuclear production for the first time (by 30 GWh). Germany also hit a milestone by providing 100 percent of its electric power consumption with renewable energy for one hour on New Year’s Day, and two years ahead of schedule, Germany reached its (2020) target of increasing renewable’s share of power production to 36%. Germany’s phase-out of nuclear power is moving ahead. 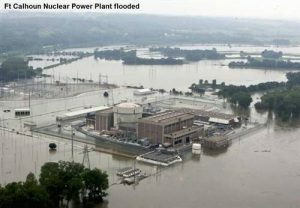 The Dec. 31, 2017 shutdown of the Grundremmingen Unit B reactor was the 10th out of a total of 17 that will be retired with the last seven to power down by 2022. Grundremmingen and its still-operating twin Unit C are General Electric Mark I models identical to the three destroyed Fukushima-Daiichi reactors in Japan. Unit A shutdown in 1975. In its article “The 60-Year Downfall of Nuclear Power in the US Has Left a Huge Mess,” The Atlantic reported May 28: “Oyster Creek in New Jersey disconnects from the grid [this coming] October with 11 years left on its license. Indian Point in New York State is to shut by 2021 due to falling revenues and rising costs. In California, Diablo Canyon is being closed by state regulators in 2025. The reactor at Three Mile Island in Pennsylvania that survived the 1979 accident will finally shut in 2019.” FirstEnergy Solutions has filed deactivation notices for three of its nuclear stations putting them on track for retirement: Davis-Besse and Perry in Ohio, in 2020 and 2021 respectively, and Beaver Valley in Shippingport, Penn. in 2021. However, such notices are often just a tactic used to garner sympathy from lawmakers who have secured taxpayer bailouts for the money-losing reactors. According to a new report from the United Nations Environment Program, more money was invested in photovoltaic or solar power in 2017 than in coal, gas and nuclear power combined. 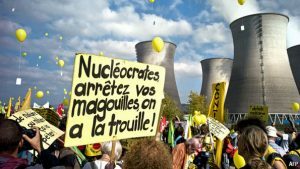 In addition, the world’s solar power capacity exceeded nuclear capacity for the first time—reaching 402 gigawatts, compared to 353 GW of nuclear. Electricity from wind power, which far exceeds solar/photovoltaic generation, outstripped nuclear powered electricity back in 2014, and by the end of 2017 amounted to 539 GW. California is set to become the first state to require solar panels on all newly built single-family houses. The mandate is expected to save buyers money in the long run but also raise their upfront costs. The rules were adopted May 8 by state’s Energy Commission and are scheduled to take effect in 2020. The Commission said it expects the solar power initiative to reduce greenhouse gas emissions by 1.4 million metric tons in the first three years. Back in 2008, Hawaii became the first US state to impose energy-saving rules in new house construction requiring them to have solar water heaters starting in 2010. Solar water heaters typically cost home buyers about $5,000 extra on their mortgage, but supporters said that island residents would save thousands of dollars on their electric bills in the long run.